Well, Wilma is still with us, but her condition hasn't really changed. She's up and down a bit but unfortunately the ups are not staying as ups. She is eating the teeniest amount of food and at least is drinking a little now, which was worrying me more than anything. I brought her inside again last night as she seemed very listless again yesterday afternoon, she stays to the outskirts of the group, sort of going through the motions of eating but not actually doing it, picking bits up disinterestedly then dropping it. She seems very hot so I wonder if she is running a temperature but maybe that is normal temperature, I have never carried a chicken long enough to judge their temp. I do wonder if this is related to the shell-less eggs which may have been her. She hasn't laid anything since she got sick. I gather an oviduct infection is one reason for this so I guess that is another possibility. 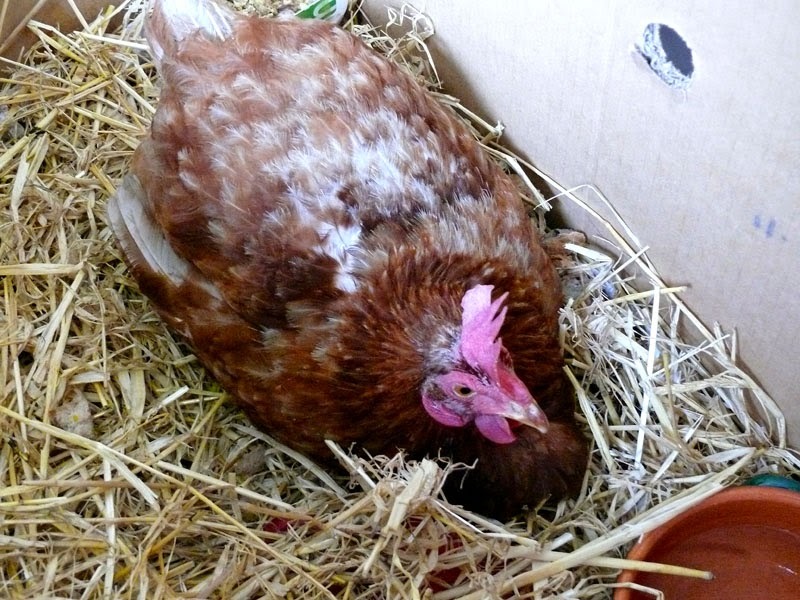 I am also worried she has something like egg peritonitis which is when the eggs rupture internally and slosh around. She hasn't laid any eggs since this started four days ago and she is only doing the tiniest amount of poo. I definitely think dosing her with aspirin makes her feel a lot better, I've done that three times now but I am reluctant to do it too often. The photo of her below is about half an hour after a dose of aspirin, she is looking much better, has had some food and seems to have a bit of strength. But she doesn't maintain it, mind you she must be weak from lack of food. 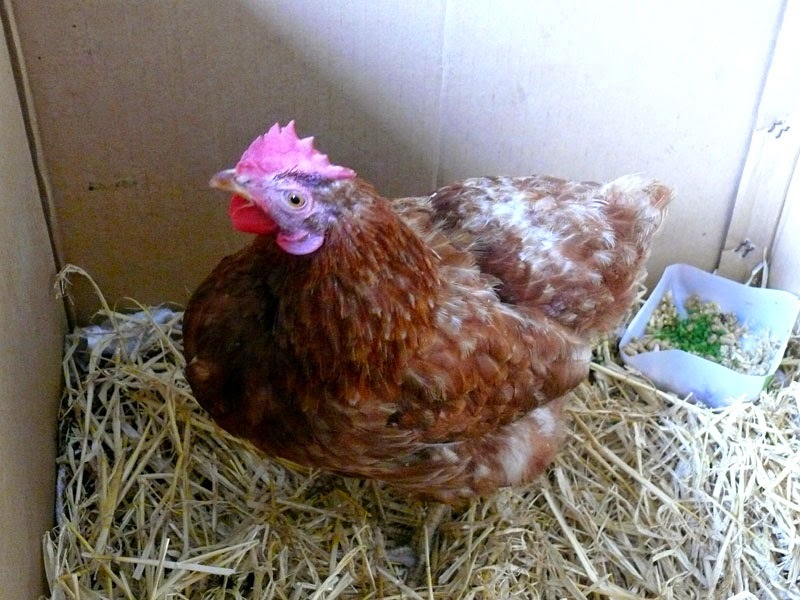 Oddly I can often persuade her to eat (and quite enthusiastically too) earthworms and chopped greens in small quantities, it's the usual chook type food like pellets that she is not at all interested in. Maybe she has a sore throat? I've put a heater in the bathroom now, I figure her energy needs to go into healing herself rather than trying to keep warm. She perked up enough this afternoon to go back with her buddies, I figured a few hours in the sun with her mates might be therapeutic. She sort of slowly followed the others around for a while, watching but not doing much. She did the occasional scratch around but again, just going through the motions rather than eating anything she found. I've just brought her back to her nursing box in the heated bathroom for the night again, she doesn't seem too bad but I am hoping another night in the warm will help. It's a mystery.